By the way, they tend to have Groupons for these events if you are interested! I had been nervous prior to the event, wondering how in the world I would be able to see what the artist was doing. Before that night, I don't think I had painted since childhood (unless pottery painting counts.) In my family, my mom and my sister are the ones with the artistic talent. In fact, my sister is probably the most talented artist I know. My parent's house is full of her beautiful and unique artwork. My friend, Shanna, who went with me is also very artistic so I was a bit intimidated going in. But luckily, when I got there, my nerves settled a bit. The room was set up in a way that there were seats very close to the artist, so I snagged the closest one. I then told the artist and the event assistant that I am visually impaired. They were very cool about it and suggested I snap a photo of the finished painting. This was a terrific idea. And the artist actually suggested it to everyone. The artist teaching the class was awesome! He was encouraging and non-judgemental. He made me feel more at ease than I thought I could be. He explained each step clearly and was open to questions. The painting we did was called "Blue Twilight" and according to him was very easy and "forgiving" (meaning you could basically do no wrong with it.) He was not the original artist of the painting. 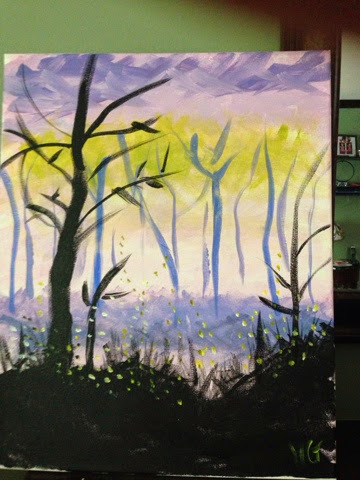 The finished product depicted a foggy forest at twilight. I feel like mine portrays a "Spooky Old Tree" (Berenstein Bears reference) but I am pleased with the outcome. It will not win any awards but I am actually okay with people seeing it! I am glad I gave this a shot! I now feel a bit more comfortable with a paintbrush in my hand. I am actually looking forward to trying again! And again you push yourself out of your comfort zone. I love your painting. It has great feeling. I bet Sarah loved it too. It is awesome how many different things you try. I am proud of you. You are a great example to your girls. And allow yourself to have fun whenever you can. That's what it is all about. better hang that painting up...Spooky Old Tree. I love it!